This update to the Fair Housing Act clarifies that an association is directly liable for failing to take prompt action to end any third party’s discriminatory housing practice if the association knew or should have know about it and had the power to correct it. 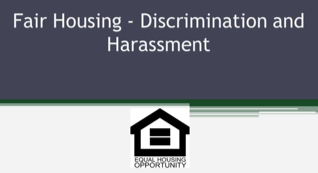 A commentator for the U.S. Department of Housing and Urban Development stated, “a community association generally has the power to respond to third-party harassment by imposing conditions authorized by the association’s CC&Rs or by other legal authority […].”* Accordingly, an association must take some action to address any alleged discrimination by residents or other people within its authority. If a manager or board member receives a complaint concerning neighbor-to-neighbor discrimination, some action must be taken. However, what action is appropriate is a fact specific question. Most neighbor-to-neighbor disputes do not really involve “discrimination,” at least not the kind of discrimination that we usually associate with Fair Housing complaints. But determining what is or is not “discrimination” is not always that easy. In light of the association’s potential liability and the sensitivity of the situation, if an association receives an allegation of discriminatory conduct, it should contact legal counsel for guidance.